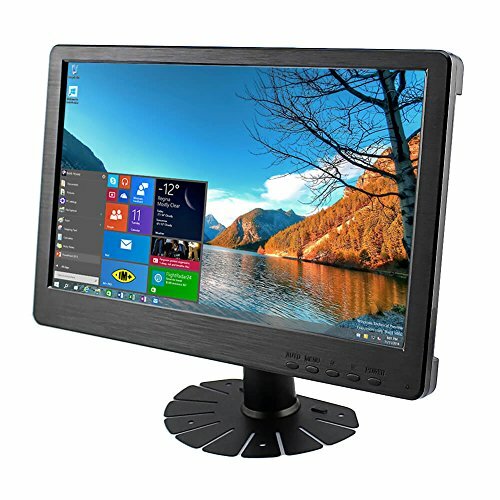 Elecrow 12 inch HDMI DVI-D VGA LED Display with IPS technology panel could be used in the Raspberry Pi PS3 PS4 WiiU Xbox360 windows system and so on. Bring you a visual feast. 1. IPS Technology Panel: Full view brings you a subversive color experience, no splash screen, ghosting as now. Also, relieve your visual fatigue, making you for a long time entertainment. 2. 12V/1A adapter power supply, low power consumption, 68676 unique display enhancement technology brings rich dark detail and easy for better image settings. Support audio speaker with built-in high-quality loudspeakers. 3. Resolution: 1920X1080 ultrahigh resolution gives a more comfortable visual experience. The image is clear and exquisite,colorful. 4. Supports multiple video input interfaces: HDMI, VGA and DVI; support audio speaker. screen size: 12 inches, panel size: 11.6 inches. aspect ratio: 16: 9 (width: height).